Waikiki Beach is a must-see at least once in your life. Countless shows and movies have been filmed here and the street that runs along the famous beach is lined with historic hotels, unique restaurants and shops. Waikiki Beach attracts honeymooners who want to check into a plush oceanview suite, families looking for beginner surf lessons in the gentle waves, and shoppers who are looking for designer clothing and unique gifts. 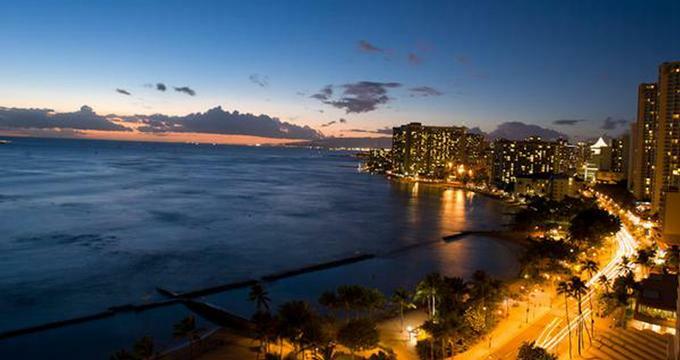 Often visitors spend a night or two in Waikiki before heading to another Hawaiian island since most international and domestic flights land in Honolulu. The hotels in the area are among the most expensive in Hawaii and if you want an ocean view room, be prepared to pay extra. The best time to look for deals is September through the first week in November. The following properties are located along the beach: Hilton Hawaiian Village which is a full service resort with many restaurants and hotel towers, the romantic Halekulani, the historic Sheraton Waikiki, the romantic Royal Hawaiian Hotel popular with honeymooners, the Outrigger where you can watch romantic sunsets from your room, the Sheraton Moana Surfrider, Hyatt Regency, the affordable Sheraton Princess Kaiulani, DoubleTree by Hilton Alana and others. There are many diverse accommodation options for all budgets. Usually the hotels that are a block from the beach or further like The Aqua Lotus Honolulu offer more affordable prices. Book a room on a high floor facing the Pacific Ocean for best views. The Royal Hawaiian and the Halekulani Hotel are popular romantic getaways. The Royal Hawaiian has a luxury beach club and a relaxing spa. Hilton Hawaiian Village Beach Resort offers a beachfront lagoon, waterfalls and five pools, including Waikiki's largest pool, the 10,000-square-foot Super Pool. The resort is popular with families because of its diverse selection of beach vacation activities. The Waikiki Aquarium is located in Queen Kapiolani Park on the Diamond Head end. This is the third oldest public aquarium in the United States. There are 2,500 animals representing more than 420 species. You'll see reef sharks, coral, monk seals, sea jellies and a variety of reef fish. Take TheBus number 2 or the Waikiki Trolley which usually comes by every 15 minutes. You can also walk from most hotels - just walk down the beach towards Diamond Head. The attractions is open daily from 9am to 4:30pm. It's closed on Christmas Day. Special hours apply on Thanksgiving and New Year's days. Kuhio Beach Park is located between the Royal Hawaiian and the Aston Waikiki. You'll be able to see the Duke Kahanamoku statue usually decorated with fresh leis to honor this surfing legend. Waikiki Trolleys stop at major attractions in Honolulu and Waikiki, including historic sites, museums, shopping malls and many hotels. The trolleys, which are classic reproductions of San Francisco cable cars, feature authentic brass and wood trimmings. The trolleys are open, making it easy to enjoy the views. One-Day Pass is $25 with unlimited on and off boarding. The 4-day pass is $45 and must be used on consecutive days. There are four trolley lines. The company's web site www.waikikitrolley.com has all the details, including maps, attractions and schedules. Reservations can be made online at waikikitrolley.com before you go. You can pick up your tickets at the Ticket Booth located at the Royal Hawaiian Shopping Center. Waikiki Beach is a popular surfing spot, especially for beginners because the surf is quite gentle. The waves are under two feet in the winter and around three feet in the summer. You'll see surfers trying to catch a wave everywhere along the shore. Two famous spots for catching the waves, Queen's and Canoes, are located at the west end of Kuhio, near the Sheraton Moana Surfrider. Surfing lessons are available at Aloha Beach Services located next to the Moana Surfrider. Private lessons are about $35 per hour and surfboard rentals are $10 per hour. Walk towards Diamond End and you'll end up in Kapiolani Park where 100-year-old trees provide excellent shade on sunny days. The area is home to the Honolulu Zoo and the Sunday Art Shows. If you would like to try different sports, there are several tennis courts, soccer fields, archery range and a 3-mile jogger's course. Walk down the shore or take The Bus number 2. The Trolley also goes there about every 15 minutes. The Preservation Society has a web site which includes a detailed map of the park and other information. The War Memorial Natatorium is located at the east end. The front archway is topped by stone eagles. The 100-meter saltwater pool was once used for training by the army during World War II and as a recreational facility. The pool was forced to close in 1980 due to deterioration. If you want to see the area from the water, take a catamaran cruise. Na Hoku II offers several daily one-hour round-trip cruises. The vessel departs from the shore in front of the Sheraton Moana Surfrider hotel. In the winter, you may see whales in the water just off the shore. This tour costs about $10 per person. Drinks aboard the catamaran cost from $1 to $2, including mai tais, water, beer and sodas. A mecca for divers, in the waters around Oahu you can observe 600+ species of fish, sea turtles, barracuda, eels and stingrays. There are over 25 dive shops on Oahu, Hawaii. Many charters offers small excursions of eight divers or less. If you are not sure what trip you would like to go on, visit a dive shop near your hotel and they can recommend dives based on your interest and experience. Often the dive shop will have videos of some of the dives they offer - the manta night dive is usually very popular. Surfing enthusiasts planning a trip in the winter can take advantage of Oahu's North Shore waves which are known to reach heights of 25 – 30 feet. Some of the most popular surfing spots on Oahu include Ehukai Beach Park, Sunset Beach and Waimea Bay. Ehukai Beach Park attracts a number of experienced surfers and body boarders in the winter. 100 yards to the left of Ehukai Beach Park is the famous Pipeline where waves fall forward to form a near-perfect tube. World championship surf competitions are held at Pipeline as well as Banzai Beach just west of Pipeline. Sunset Beach features waves reaching 15-20 feet from September to April, attracting surfers from all over the world. Waimea Bay, also located on the North Shore, offers some of the biggest waves for surfing. Oahu alone boasts 110 miles of diverse beaches, ranging from powerful waves on the North Shore to calm waters along the South Shore coastline. The South Shore offers many family-friendly activities such as swimming, picnicking and snorkeling. Water temperatures range from 75 to 80 degrees year round. la Moana Beach is located withing a 76-acre park which offers tennis, jogging, rollerblading, picnicking, sunbathing, swimming and surfing. The famous Waikiki Beach, two miles long and one half mile wide, is actually a collection of many beaches. The area is a favorite for swimming, snorkeling and people watching. Choose from specials with free nights if you are planning a longer stay, or get a discount on your room rate, spa treatment or golf. 4 nights in Waikiki is the perfect way to de-stress, learn some surfing and relax with Hawaiian Lomi Lomi massages. At the Royal Hawaiian, vacationers get their 4th night free with the "Sunsational Savings" package. In addition to the free night, the package includes Free Breakfast for Two and a Complimentary room upgrade if available. You can book a room and airfare package through the hotel web site as well. If you don't have time for a 4-night getaway, book an Ocean View room and save 50% (mention the discount code SPG50PRO when booking). The discount will be reflected in the rate when you book. Aston Hotel is offering discounted rates. Partial ocean view rooms start at $193 per night (they usually go for $227). Halekulani is popular with couples who like luxury rooms and suites with a view. The spa package includes two treatments (for 75 minutes), a spa gift, breakfast, and free admission to several local art venues. The package starts at $2,340 for 3 nights. If you want to play a few rounds of golf while on vacation, ask for the 3-night golf package which is similar to the spa package, with rates from $2,205 for 3 nights. Check into the stylish Moana Surfrider and receive 35% Off and 5th Night Free (rates from $375 per night). You have to be a Starwood Preferred Guest to get this deal (it's free to join and you can sign up online before you book your stay). The special will also give you Double Starpoints, 10% off at the spa, 35% off at several restaurants and 35% off on car rental (Avis only). The Outrigger is offering rooms starting at $376, including a stand-up paddle surfing lessons for 2 person, 2 beach chairs and 1 beach umbrella and Free Internet access. Marriott is offering nightly rates from $199.